Caption Slip reads: "Photographer: Rustan. Date: 1957-11-12. Reporter: Waymire. Assignment: Royal Ballet Arrival. 3/4: S. Hurok, manager, greets Maryon Lane, Rowena Jackson and Svetlana Beriosova. (Rear) David Blair and philip Chatfield (dancers) and Robert Irving, musical director. 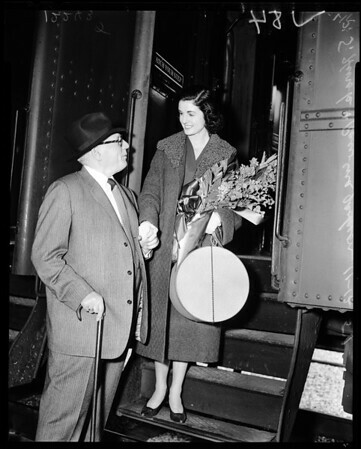 84: S. Hurok, manager, welcomes Rowena Jackson as she steps off special ballet train."